For my new book, Sevastopol’s Wars: The Crimea from Potemkin to Putin, I have vainly tried to find an authoritative reference to the oft-cited quotation, “Bolshevism must be strangled in its cradle,” or “the foul baboonery of Bolshevism,” usually noted for early or mid-February 1919. It is not contained in his famous Bolshevik Menace speech of 11 April 1919, published in Robert Rhodes James’s volume, Churchill Speaks.—Major General (Ret.) Mungo Melvin CB OBE, President, British Commission for Military History. The aid which we can give to those Russian armies which are now engaged in fighting against the foul baboonery of Bolshevism can be given by arms, munitions, equipment, and by the technical services. It is a malicious statement against the interests of the British Empire to suggest that it is necessary for us to prolong the action of the Military Service Act because of enterprises which we have on foot in Russia. Lest any reader conclude that this might have been good advice for the Bush or Obama Administrations in regard to fighting terrorists in Afghanistan, Iraq or Syria, may we note that the situations are entirely different. Churchill’s words are often used to bolster modern political points—but not always with precision. This question provoked interest among Churchill scholars with whom we share Q&A emails. The following is a distillation of their comments. Churchill’s initial anger at the Bolsheviks stemmed from their refusal to rejoin the fight against Imperial Germany after the Bolshevik Revolution in the first World War. Briefly, he hoped to convince them to rejoin the fight, making the suggestion that the Allies send a “commissar” to Russia to negotiate the deal. His surprising recommendation was Theodore Roosevelt. After World War II, he returned again to the threat of communism, and was roundly reviled by the Western media (see cartoon) for turning on his former Soviet allies—only to be reviled by the other side when, in the early Fifties, he sought a “settlement” of the cold war with Stalin’s successors. But that is another story. 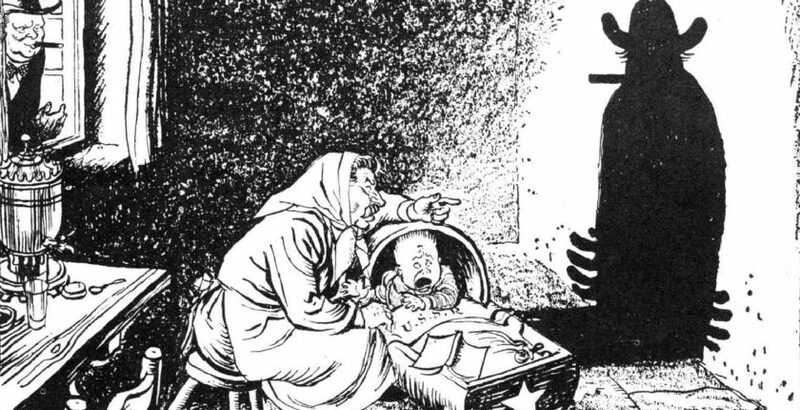 Featured Image: “Beware the Bogeyman”: 13 March 1946, a newspaper cartoon in the wake of popular uproar over Churchill’s “Iron Curtain” speech the week before; a few years later, there was less talk of false alarms. 1 Robert Rhodes James, ed., Winston S. Churchill: His Complete Speeches 1897-1963 vol. 3, 1914-1922, vol. 3 (New York: Chelsea House Publishers, 1974), 2671. 2 Winston S. Churchill, Churchill in His Own Words, ed. Richard M. Langworth (London: Ebury, 2012), 148; and James, His Complete Speeches vol. 8, 7774. 3 Churchill, Churchill by Himself, 381.